There are basically no non-sentient lifeforms of a size that could, and would be willing to, pull wagons from city to city. The only lifeforms that physically could, are sapient. The only realistic alternative I see is using ships and boats. Convenient and non-taxing transport for people is also a factor, and seems to fall into the same alternatives. I imagine this would make a Venice-like canal city a more likely; Intra-city transport would effectively require the canals, no? I am somewhat uncertain if this is even an appropriate question. You are kind of answering your own question. Human labor is the only possibility you did not exclude by your world setting. There are plenty of historical societies that didn't have beasts of burden: anybody in the Americas south of dog-travois or outside of llama territory, or Africa south of horses, and Australia and New Guinea. My understanding is that anybody who built big things or moved things over long distances had to use human labor. There wasn't any other way to solve those problems than "throw more peasants at it." Your question contains a false assumption about medieval transport, namely that it primarily featured beasts of burden and carts. This is very much incorrect. The first thing you have to remember is that there were no roads between cities. Not as we understand them, not as the Romans would have understood them, and barely even as good as a farm track or a logging trail today. Carts were practical for local transport around the farm or village, and perhaps to the next village along. Travelling any significant distance though was unbelievably difficult. Moreover, it took some time before medieval Europe had enough horses to spare for a farmer to be able to afford them, and draft oxen are slow creatures. Any significant transport therefore went by water. Whether this was down rivers or along the coast, basically anything or anyone going any distance used boats. As the Industrial Revolution took off, this continued into canals. Steam engines took over somewhat later, of course. Roads did improve in the 19th century, so a carriage had a better-than-average chance of actually arriving at its destination. But it wasn't until well into the 20th century that roads became a truly practical proposition, and that was driven by cars. So, you're looking at the same kind of transport structures as medieval Europe. Every city and major town will be on a navigable river or by the sea. Your medieval society doesn't have the technology to build canals, so they're limited to existing rivers. Steam engines. The first steam engine was developed well before medieval times. However with the prevalence of slave labor and beasts of burden there was no great practical application at the time. Lacking that however, there might be a greater impetuous to put it to work. I think ropeway conveyors powered by windmills/watermills would do on level areas and just ropeways powered by gravity would suffice between areas where there is a significant height diferencial. Rope-ways, windmills and watermills have been used even before medieval times (see wikipedia and http://www.lowtechmagazine.com/2011/01/aerial-ropeways-automatic-cargo-transport.html) and a ropeway need not be a single length of rope, it can be a series of shorter ones supported by poles in between, so medieval age materials and techniques for rope making could be enough. Don't have enough knowledge to talk about materials or difficulty of engineering but I think making a series of rope-ways would solve at least intra-city and city to nearby settlement transport (considering many settlements aren't more than a couple hours by foot from each other https://www.youtube.com/watch?v=3PWWtqfwacQ). Transporting goods before the ropeway was complete would have to be done by people I suppose. One alternative not yet considered, depending on the nature and size of the sentient 'life forms' is that they, themselves, observe the need for the transport of materiel or other species and choose to to offer their services, for profit, as hauliers. This is going to depend on how big/heavy the load is, and what terrain you want to transport it over. Smaller loads (less than 100 kilos?) over broken terrain, some people just carry it (think of the stereotypical image of a 19th century expedition with pairs of porters carrying supplies through the jungle on a pole over their shoulders). If there is some kind of path, put it on a wheelbarrow. A central-wheel design puts all the weight on the wheel so the person essentially only needs to steer and push. Here is a great write-up of wheelbarrow transport. The path only need be as wide as a walking path, not a full wagon-width, but it does need to be hard and smooth enough for a big wheel to traverse. Bigger roads could handle wagons pulled by people in order to move bigger cargo. The really heavy loads (more than a few hundred kilos) will need to be transported by barge. If the terrain is suitable, either from slow-moving rivers or if canals could be dug, a barge is the overwhelmingly the best mode of transport in terms of weight capacity and energy required to move it (can be pulled along by someone on an adjacent walking path or punted along with a stick). Unfortunately digging canals is extremely labor-intensive, which is why natural waterways are one of the biggest influences on where cities developed. Water transport is overwhelmingly useful. Beside the already mentioned solutions, if winters are cold enough, people could transport goods using sledges. It'll require humans to provide the labour, but you can transport more goods than carrying it. It may also mean trade happens more in some parts of the world than in others. Then what question are you really asking? Alternative forms of travel and transport than boats, or are you asking what life would be like if society was based on a city like Venice? I visited Venice once. It is a very beautiful city with lots of canals, bridges, etc, but the old town which everyone thinks about is actually only a small area of a couple of square miles. I could not imagine what a large sprawling city like Los Angeles would look like if there were canals instead of streets and rivers instead of freeways. Ants can lift 1000x their own weight. So build a "sled" that rests on "giant" ants (the size rats). The ants are bred and have the queen installed inside the sled to communicate navigation. Canals; bah. Slave-drawn wagons; Ho. Hum. What else?? Jules Henri Giffard, a French engineer and inventor, took note of Jullien's design. He built the first full-size airship — a cigar-shaped, non-rigid bag that was 143 feet (44 meters) long and had a capacity of 113,000 cubic feet (3,200 cubic meters). He also built a small 3-horsepower (2.2-kilowatt) steam engine to power a three-bladed propeller. The engine weighed 250 pounds (113 kilograms) and needed a 100-pound (45.4 kilograms) boiler to fire it. Medieval tech can build you an airship. You need a wicker frame (make a few spare Wicker Men this Beltane), and a light envelope that can contain your lifting gas - greased silk would work, or isinglass. Hydrogen is the lightest lift gas, but the molecule is so small it is hard to contain and it requires some alchemy to produce. Helium is good but it occurs only as small percentages in natural gas and must be refined. But what about natural gas as a lifting gas? Natural gas comes out of the ground in some places. People know it is something different because it can sustain a flame. Methane is light enough to be used as a lifting gas and has the advantages of coming straight from the ground and being a larger and so more easily contained molecule. Plus if you are lucky maybe there is some helium in there as well. 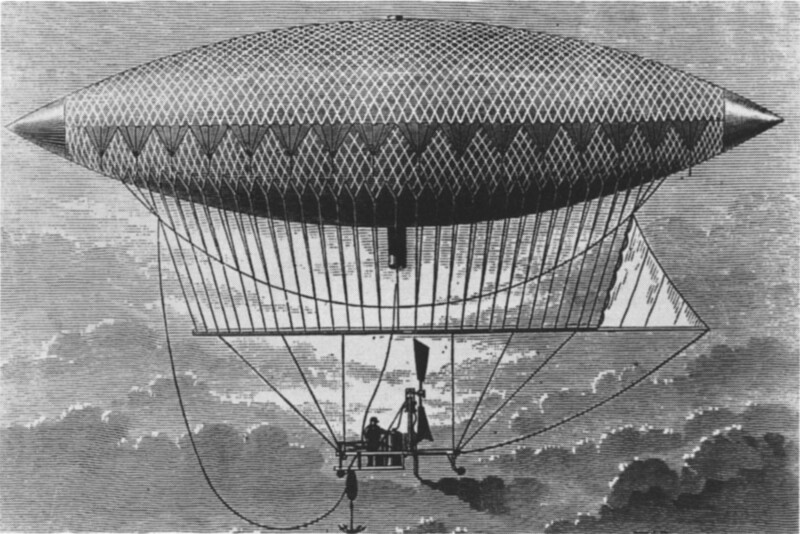 The depicted aerostat has a steam engine. But you could have crew with handcranked propellors, or sails. or giant air oars. Or just go before the wind like a ship with a fixed sail. You would wait for a favorable wind and launch! Those of you interested in seeing how medieval airships might look are invented to dive down the rabbit hole of google image, from which I have just returned. I'm picturing a world where it is - like most of the other posters have suggested - humans who do all of the heavy lifting. However, this world could have used selective breeding to create a race of humans that are bigger/stronger and used only for the purpose of manual labour. Trained from an early age that all they'll ever do is transport cargo, or a rigid religious system in place that keeps them in their place - so that they don't rise up and overthrow their weaker brethren. Selective breeding of horses was used in medieval times on our world, so another world revolving around human labour could do something similar. All of the methods for moving goods around the world are then tailored to these larger humans; harnesses for strapping goods, (or even smaller humans) or human-drawn carts, pedal-cabs in larger towns. With an abundance of compliant, strong, labour, perhaps this world doesn't even think to develop technology to minimise human labour. They can always throw more larger humans at the problem. This world could get very dark and twisted very quickly. The aeolipile is the first recorded use of steam as power we know of, having been recorded in the 1st century AD. Other notable points in history: people using fire and cooking 2 million years ago, fire being commonplace 125 thousand years ago, pottery 30 thousand years ago, and simple machines in 3 BC. Even without slavery, I think there is a good case for saying that at some point, somebody in early times would figure out how to control heat pressure. Something like "Why did that clay bowl explode in the fire?". Not the answer you're looking for? Browse other questions tagged medieval transportation logistics or ask your own question. What safety features are needed for an “awesome race of super horses”? What options are left for a hunted sorceror in this situation? What are the feasible means of keeping a space station existing and operational for thousands of years? What are modes of instantaneous travel as alternatives to matter-to-energy transport? What are the structural implications for a pseudo-abrahamic religion based not on shepherds' but farmers' mythology? What are options for glazing in pre-industrial housing? Are there any advantages of rail vehicles in space?